Given the ongoing discussion of the legal dispute between Stardock and Paul Reiche and Fred Ford, designers of Star Control I and II, I wanted to take time to make Stardock's position clear and address inaccuracies that have been promoted. As the need arises, I’ll continue to update this post with additional questions and answers. Q: What are the issues in dispute? A: On the eve of launch of the beta of Star Control: Origins in October 2017, a game Stardock has spent the past four years working on, Paul Reiche III and Fred Ford, the designers of Star Control II for Accolade 25 years ago announced a new game, Ghosts of the Precursors as a “direct” sequel to Star Control even going so far as to promote it as Star Control: Ghosts of the Precursors. They did this despite knowing Stardock had acquired the Star Control IP in 2013 and knowing before hand our announcement schedule. Their actions created confusion in the market as to the origin of Star Control games which is why we have trademark laws. When Stardock asked that they cease and desist marketing their game as a sequel to Star Control they refused and began demanding that the sale of the DOS games, which had been on sale continuously since before Stardock acquired the IP and for which they had been receiving royalties for during the entire time cease and began to disparage Stardock publicly in the press. Despite Stardock's best efforts to reach a private, mutually beneficial co-existence agreement, Paul and Fred responded with increasingly hostile, misleading public attacks and served Steam and GOG with DMCA take-down notices on all of the classic DOS games, including Star Control 3 which they had no involvement with all while continuing to promote their new game as the "true" sequel to Star Control. As a result of their broad interpretation of what they believe they have rights to combined with their willingness to instruct their lawyers to issue a DMCA take down notices, even on titles in which they had no involvement in, combined with their refusal to cease promoting their game as the sequel to Star Control, Stardock was forced to file a complaint over their continuing trademark infringement. In retaliation, Reiche and Ford filed a countersuit seeking to cancel the Star Control trademark and for copyright infringement due to the sale of the classic Star Control games on GOG and Steam and are even suing GOG despite the fact that Reiche and Ford were the ones who claim to have helped get the classic Star Control games onto GOG. Q: Why did Stardock file the initial lawsuit against Paul and Fred? A: We had no choice after Paul and Fred filed DMCA claims against the distribution not only of Star Control 1 and 2 but also Star Control 3 which they admit they had no involvement. The DMCA claims were reversed, but it was clear that our ability to create more experiences in the Star Control multiverse for fans would be at risk if they are allowed to continue to misrepresent their new game as being associated with Star Control without a license while simultaneously making broad, unsupportable claims of ownership on ideas and concepts that are present not just in Star Control games but games in general. Q: How did these unfortunate events come to pass? Paul and Fred ask what Stardock acquired from Atari to which Stardock responds: The trademark, assets to Star Control 3 and the right to sell distribute, market and promote the original trilogy. Paul acknowledges Stardock's position and asks how much it cost. Stardock updates Paul and Fred on Star Control: Origins release schedule and begins planning its 25th anniversary which will include releasing the classic games onto more channels. Stardock asks if there would be any interest in having SC2 ships appear in Super-Melee. The games are submitted and approved by Steam in preparation (Summer 2017). Paul and Fred state they plan to make a sequel to Star Control II which would violate Stardock's trademark rights (you can't claim your product is a sequel to another company's product). Paul and Fred also assert that Stardock does not have a license to their IP. 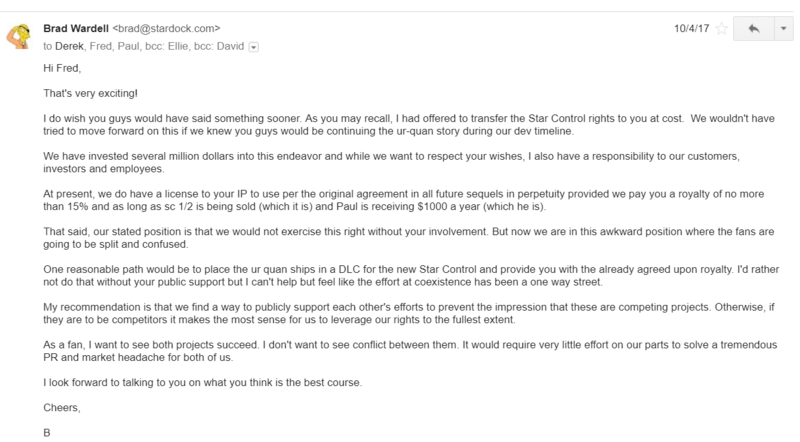 In the email below Paul and Fred state that each party should work within its respective rights: Stardock having the Star Control trademarks and Paul and Fred owning all the IP rights to the works they created. Note that at this point, Paul and Fred recognized that owning the registration to the Star Control trademark also includes many common law trademarks. Hence "trademarks" plural. Stardock points out that it has a license to the IP to use provided it pays a royalty of 10% (which is why Stardock has asked in the past for a new licensing agreement as 10% is too much for a cameo of a classic character). Stardock CEO, Brad Wardell suggests talking on the phone to iron things out. (October 2017). Paul and Fred refuse Stardock's proposal and begin to demand changes to Star Control: Origins. Despite having just stated that their efforts should be "separated" by each parties rights (Stardock with the trademarks) Paul and Fred almost immediately violate that understanding by using the Star Control trademarks throughout their announcement. 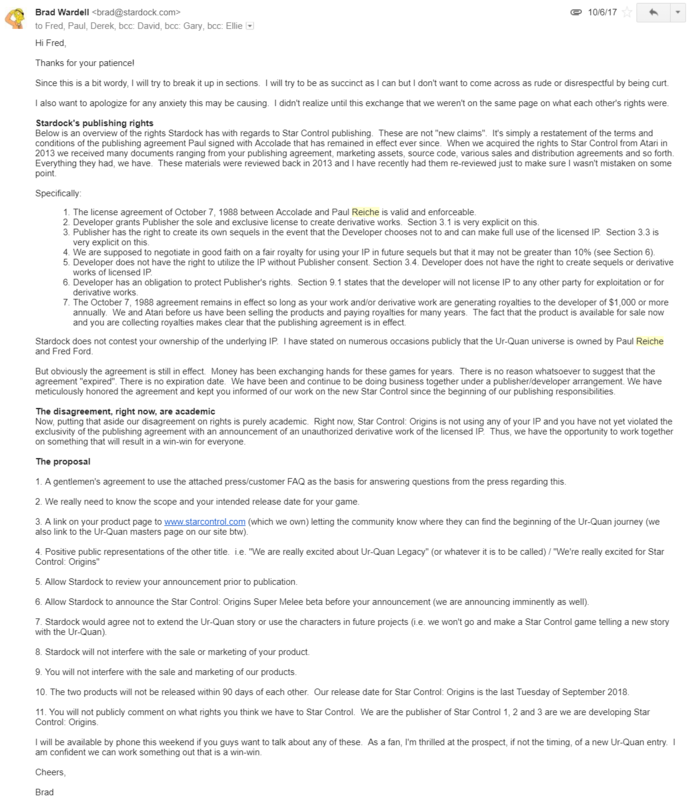 The Star Control trademark is mentioned 4 times in the announcement, each with an (R) without mentioning Stardock leading a reasonable consumer to believe it is their mark (Ghosts of the Precursors is listed once). 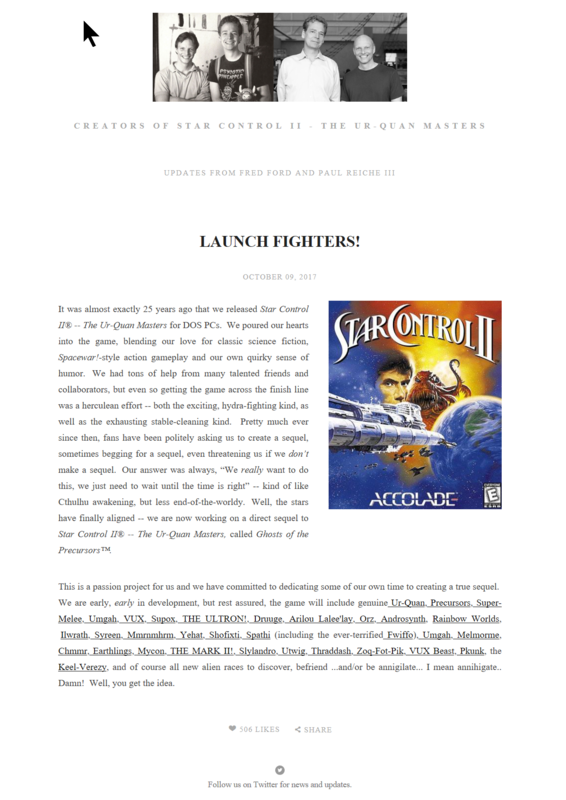 Paul and Fred claim they "released" Star Control II on the same page that shows Star Control II with the Accolade mark misleading the relationship between Accolade and Paul and Fred (who, regardless of their tremendous work, were contracted by Accolade to create content that was then licensed into Accolade's product). The above is one example among dozens. 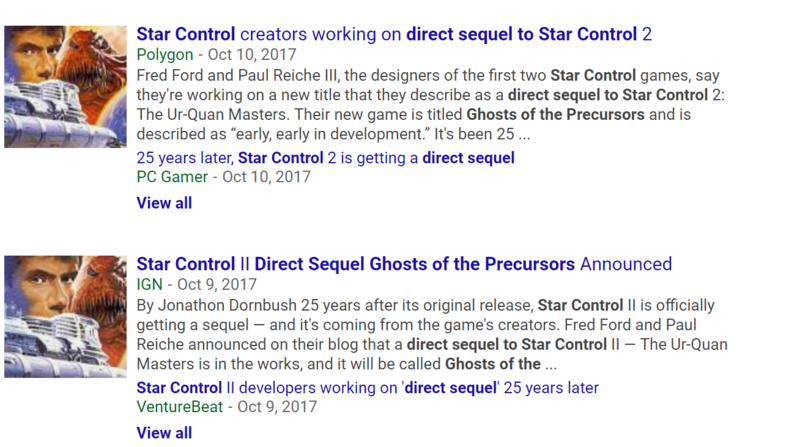 Paul and Fred publicize coverage of their new game with each post using the Star Control mark but not a single one using the term "Ghosts of the Precursors". Looking below, what's the name of their new game? 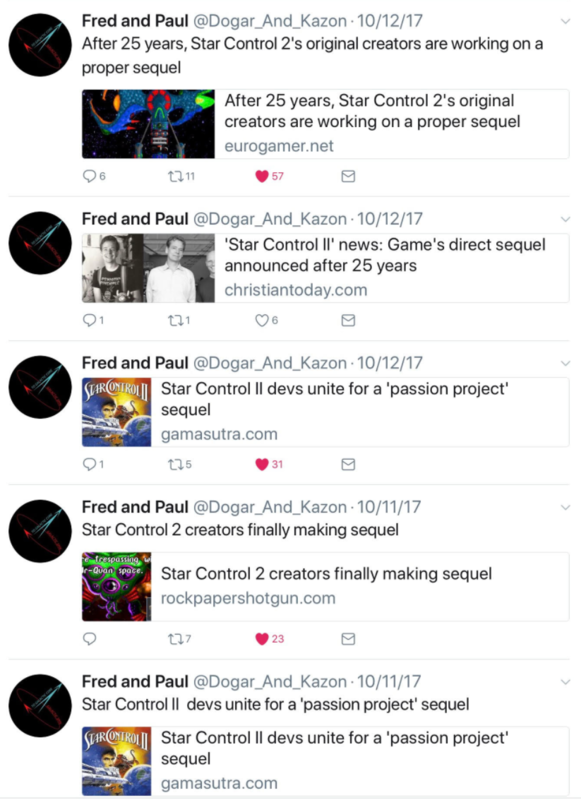 Many posts and articles appear, endorsed by Paul and Fred that state that their new game is a "direct sequel" to Star Control. Some refer to it as Star Control: Ghosts of the Precursors. Paul and Fred's attorney files a lawsuit against Stardock alleging copyright infringement and other causes of action. (February). 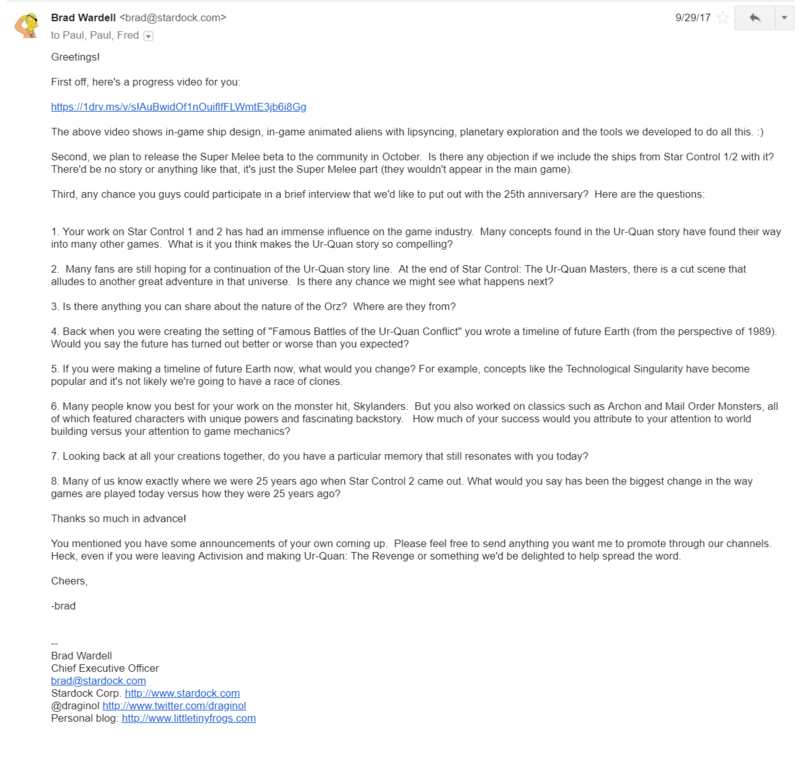 Paul and Fred post an email exchange they claim is between themselves and Atari, something they had not shown to Stardock and still have not provided to Stardock to evaluate. To make clear that Stardock's concern is regarding the protection of its Star Control IP and not the sales of Star Control: Ur-Quan Masters, it decides that it will be suspend sales of the classic games until the dispute is resolved starting April 4. (March 2018). Q: Don't Paul and Fred contend that the 1988 licensing agreement with Accolade has expired? A: That is their position. However, since the dispute began, Stardock has chosen to err on the side of caution and operate as if that is the case. Stardock requested that GOG and Steam remove the games for sale pending a resolution. The 1988 agreement, however, does not have anything to do with the Star Control trademarks were were always owned by Accolade and were assigned to Stardock. Stardock's ownership of the Star Control trademark is incontestable. You can review the federal registration that dates back to the 1990s here. Q: But isn't it true that Star Control: Origins has very similar gameplay to Star Control II? That you explore planets, travel through hyperspace to different star systems, meet with aliens? Couldn't their copyright of Star Control II mean that Star Control: Origins is too similar? A: You cannot copyright an idea. Putting aside that Star Control itself borrowed many ideas from many other games, copyright protects creative expression. Not game play. Obviously, anyone who has ever played Angry Birds or Candy Crunch already knows this. That said, Star Control: Origins is not a clone of Star Control II. The 25-year gap in game technology allows Star Control: Origins to deliver a much richer experience. So while the core concepts remain true: You are the captain of a starship traveling through this part of the galaxy, meeting aliens, engaging in battles, exploring planets, the implementation is very different. In short: Gameplay clones aren't illegal and even if it were illegal, Star Control: Origins is not a clone. Q: Why does Stardock claim that Paul and Fred were not the creators of Star Control? A: Paul and Fred were the designers of Star Control I and II. In the credits, on the box and elsewhere they had previously officially listed themselves as either developers or designers. While Stardock has no objection to “creators” in the casual sense, legally, and when trying to promote a product in commerce, they are not. Most of the Copyrighted material people think of as being important to Star Control was created and owned by others. For 25 years, Designer was their official designation. It is Stardock's opinion that they have begun to focus on referring to themselves as "creators" in their marketing in order to give the impression that Ghosts of the Precursors would have the the same creative core as Star Control II. This is not the case. What most people do not realize is Star Control II had, in essence, the dream Sci-Fi team as mentioned in this 25th anniversary tribute. The lead animator went on to lead the animation at Pixar and is the director of the Minions movies. Many of the alien designs were created by the artist who went on to design Darth Maul and other Star Wars and Marvel movie characters. Many of the most quoted lines came from seasoned Sci-Fi writers. The engaging music was created by others. We respect Paul and Fred’s crucial contributions as well as the rest of the talented team who worked on Star Control. Q: Who owns the Star Control trademark? Q: What does Stardock want out of this lawsuit? A: Our ONLY goal is to protect our ability to tell more stories in the Star Control multiverse. We remain fans of Paul and Fred and their contributions to Star Control. However, given the confusion they’ve created in the market by promoting their new game as a “true sequel” to Star Control II combined with their abuse of the DMCA system to take down even Star Control games they had no involvement with, we are forced to act to prevent them from continuing to create confusion. Consider some of your favorite games or movies. Now imagine if someone instrumental to the development of that game or movie went on to claim to be making a sequel to that game or movie without the consent of the owners of that trademark? What would be the result? Q: But doesn't Paul and Fred own all the in-game IP? A: Paul and Fred own whatever IP they created. What that is remains to be seen. Stardock does not claim to own any copyrighted material within Star Control II which is why the new Star Control: Origins is set in its own universe with its own characters and story. 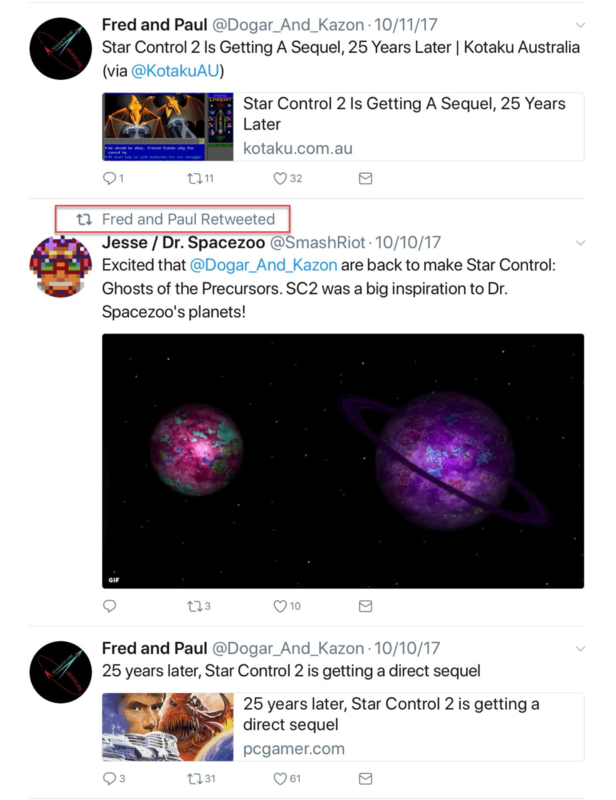 However, as of April 2018, neither Paul or Fred had any rights to any of the art and much of the writing in Star Control II. However, even if they did, it would be irrelevant as Stardock isn't using any copyrighted material from Star Control 1, 2, or 3 in the new Star Control games. On the trademark side, simply because you were contracted to work on a game does not grant you the right to make a new game and claim it is related regardless of what copyrights you think you may own (otherwise, you could argue that Unity and Epic could start to make sequels to other people's games). For example, Paul Reiche is the President of an Activision studio. Blizzard is another Activision studio. Stardock was once contracted to develop a StarCraft expansion (StarCraft: Retribution). One can imagine the response Stardock would receive it it were to announce a new game as a "direct sequel" to StarCraft: Retribution. By contrast, not only did Paul and Fred announce their new game as a "direct" and later "true" sequel to Star Control, they even used the Star Control II box, that was acquired by Stardock, to promote it. As much as we respect Paul and Fred, the fact is, Paul Reiche was contracted as an independent contractor (not as a company) by Accolade to develop Star Control for Accolade. This is a fairly routine method that developers get products made (Stardock's own Fences, WindowBlinds, Groupy, IconPackager, etc. were developed using the same method). Q: Do these legal issues have any impact on Star Control: Origins? Game sites don't make legal judgments on the merits. They simply remove the content. No one, to our knowledge, has ever tried to do this on a shipping game before. You can read our response here. Q: Why did Stardock trademark Ur-Quan Masters, Super Melee, and other names from the original games? A: Once Paul and Fred began to challenge the validity of our intellectual property we were forced to take steps to solidify our common law rights. Specifically, Paul and Fred have worked to try to separate Stardock's Star Control mark from its association with the classic games. The reason companies were bidding to acquire the Star Control trademarks and willing to pay $300,000 for it was for the association with the classic series. The trademarks, being in active use in connection with the beloved classic series, made it valuable. When Paul and Fred began to seek to cancel the Star Control mark and make public statements that Star Control: Origins isn't related to the classic series Stardock felt obligated to respond by reinforcing its intellectual property rights to the classic series. As background: Stardock always had the common law trademark to Ur-Quan Masters. It's the sub-title to Star Control II after all and was, by Paul and Fred's admission, available in commerce on GOG even before Stardock was involved. Super-Melee is literally a promoted feature from Star Control. The alien names are so strongly associated with Star Control that if you Google Star Control aliens they come up as the first entry. They have made it very clear that they believe that they have the right to associate their new game with Star Control on the basis that they have previously licensed content to Star Control games. They have no such right. Q: Why did Stardock really need to trademark the Star Control 2 alien names? A: Star Control fans expect new Star Control games to have the Spathi, Ur-Quan, Orz, etc. We originally chose not to include them in Star Control: Origins in deference to Paul and Fred who asked us not to. This creates confusion because Stardock alone owns the Star Control universe. That doesn’t mean it owns any lore or stories created by others. It just means that Stardock has the right to determine what is canon in the Star Control universe. The Star Control aliens are associated with Star Control. That doesn’t mean Stardock can use expressions and stories of those aliens without permission. But it does mean Stardock has the right to create its own stories and expressions for the Ur-Quan, Spathi, etc. When Paul and Fred were contracted to develop Star Control I and Star Control II for Accolade, they were allowed to keep certain copyrights to the works they created. But all trademarks were explicitly defined as being owned by Accolade. Incidentally, their name was put into a diagram because they literally announced their game as a sequel to Star Control II. They associated their new game with Star Control, not the other way around. Q: Is Stardock trying to prevent Paul and Fred from making new games in their universe? A: No. Stardock wants them to create new games in the universe they created. However, this needs to be handled in such a way that there is no confusion as to the relationship between Star Control and the works they licensed for Star Control II. 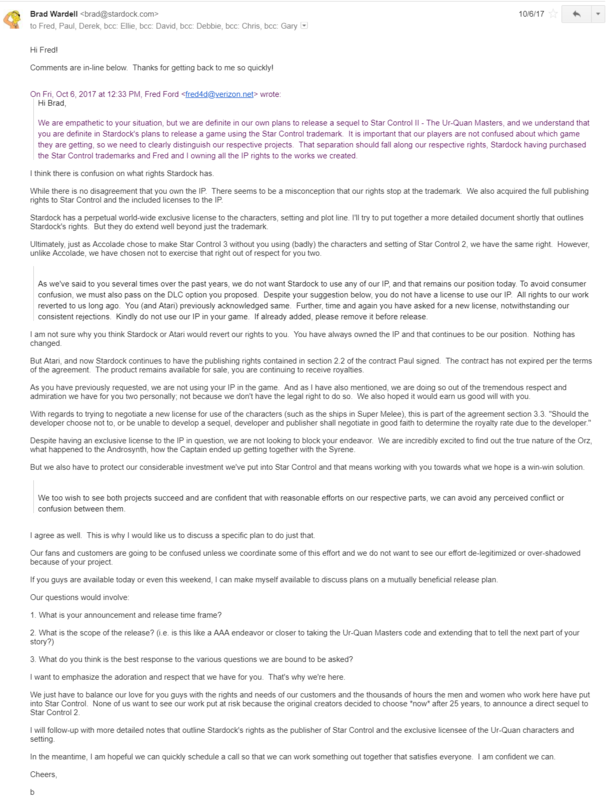 Q: If Stardock wants a new game from Paul and Fred, why did the settlement offer that Paul and Fred publicly posted that they claim came from Stardock demand that they "surrender" their IP? A: It is regrettable that Paul and Fred chose to violate confidentiality and post, without context, a settlement offer. Paul and Fred have been offered many settlement proposals with many different terms and are intended for negotiation by both parties to try to reach an amicable settlement. Stardock paid over $300,000 for the Star acontrol IP which included the trademark and copyright to Star a Control 3. The Star Control brand is, in our view, far more valuable than any copyrighted material within a 25 year old DOS game. Source code and alien art. Nothing else, as far as we can discern, falls under copyright protection. You can’t copyright “lore” or timelines, or alien names, or game designs or UI. Thus, all we would gain would be the ability to have Ur-Quan that look just like the old Ur-Quan and space ships that look like the classic space ships. The greater value would be to make sure this kind of dispute didn’t happen again. But that value would still not overcome the damage they’ve caused in the market place due to the confusion on who owns Star Control and the ill will due to their PR company issuing false and misleading press releases and publicizing the dispute in a way to maximize ill will. Not to mention the considerable and rising legal costs. None of this would prevent Paul and Fred from making a new game if that really is their desire. Stardock, in turn, would have been happy to license, free of charge, any IP they needed to make their new game. Our respect for the work Paul and Fred did 25 years ago remains undiminished. However, that respect does not give them the right to disrupt our product development at the 11th hour or misrepresent their new endeavors as the "true" sequel to our products. Our dedication to bringing you a new Star Control game remains unchanged. BETA 2 of Star Control: Origins is due in a few weeks. Thank you for being fans of Star Control, and supporting our effort to make a great new game in the Star Control franchise. Kavik, I get that you're passionate about SFB, I really do. But StarCon and other similar games (Starflight et al) have a pedigree that goes all the way back to Space War, which came out in 1962, SEVENTEEN YEARS BEFORE Star Fleet Battles was first released in 1979. If anything, SFB ripped off Space War. I'l acknowledge that a lot of the ship designs etc in Starcon bear a lot of resemblance to SFB, and maybe there was some IP theft going on, but all you've been going on and on and on (and ON) about for days now on this forum is that everyone who ever made a space game stole it all from SFB. Asteroids came out the same year as SFB (so it wasn't a rip off either), and looking at Paul and Fred's early sketches, StarCon owed a lot of Asteroids. SFB is not the be-all-end-all nor is it the overall-and-only-grandfather of space games, my dude. Either Paul or Fred, or both, definitely played SFB. At least one of them was also a really big fan of the Hydrans, I can even tell you that much with certainty without ever having spoken too them about it. Space Wars was an Enterpirse looking ship and a wedge shooting single dot bullets at each other. Almost every weapon and device in Star Control is a weapon or device from SFB. The same exact thing is true of Master of Orion. There is no game design to be done for you to be playing Star Control II on a table top within three days if we really wanted to make that happen. It already exists, we would just need to make the "scenario" or "campaign" to tell that story within the SFU. Replace the F&E map with the Star Control II map. Have a few of the Prime Directive guys extract all of the story and encounter locations from SCII and write it up as a Prime Directive adventure scenario. Then you'd just need to decide on what ships you wanted. You could either use the SCII ships we already have in our Babylon 5 game, or I could make you exact matches of the SCII ships within SFB so that it would be just like SCII. If you use the B5W ships it will all be far more detailed and complex because they are full SFB Ship System Displays. If you want SCII-like "just crew as hit points and an energy meter ships", that is very easy to do. They I would just quickly make them for you as SFB fighters instead of ships, so no Ship System Display (SSD, or "Faster Than Light"). Star Control was just Paul and Fred making the fully interlinked Star Fleet Universe as an arcade game. Star Control is mostly Prime Directive (the RPG) and SFB. Master of Orion is mostly SFB and Federation & Empire (the strategic game). Too any SFB player, and our community has known both of these games are just rip offs of the SFU since they were released, it is blatantly obvious that this is the case. In the case of Master of Orion, I even know the story of how and why it came into being. There really isn't any thing to argue about here, and SFB player can tell you that Star Control is the SFU, just like Master of Orion is. As for just exactly where SFB's place is in the world of sci-fi... It really is the end of the chain that created the Federation Star Fleet other than Enterprise, and all the ships of the other races as well. Franz Joseph, Lou Zucchi, and Steve Cole are more responsible for the ships/fleets and technology of Star Trek than Gene Roddenberry or Paramount. Go read about Franz Joseph and his book, he was actually a part of the reason that Star Trek was brought back Lou Zocchi and Steve Cole were practically his "partners in crime". And it's not just Star Trek, since I've mentioned Babylon 5 Wars... This game was made by former SFB Staff member Bruce Graw, who had many other SFB Staff members act as his own B5W Staff" in making it. B5 creator JMS was an SFB player and helped to arrange for the SFB Staff to be making his game. B5W is considered canon by JMS, and like SFB adds a whole lot to B5 you've never even heard of before. JMS actually wrote some of what is in B5W, including the alternate Mars histories. So SFB was not only very influential over Star Trek, but also Babylon 5! The entire thing is actually available free online. Here is the beginning of what you know as "Star Trek lore". Roddenberry had defined very little of it in TOS. Franz Joseph created the true basis of it with this, which was also instrumental in bringing Star Trek back, and Lou Zocchi and Steve Cole took it from here and ran with it into creating the "star fleets" of all of the major races of the Star Trek universe. Roddenberry had defined very little of it in TOS. I'll give you that yes, most TV shows don't pack insane amounts of lore into them to be digested as it'd be too much for the general viewer, which they allow the lore to develop in the extended universe in their movies/novels/comics/games/etc. Keep them to an absolute minimum in post replies, most people hate reading through off topic walls of text. When a post about what Fred & Paul is given and it turns into multiple pages of SFB/SFU is god bow down to the glory that is the great granddaddy of SciFi that just drags everything far from the topic. Create a site dedicated to Science Fiction ship 'Genealogy' that people could see the base ships the new ships as well as the evolution of the ship(s) with their connections back to their ancestors. This thread isn't about SFB. It is about Paul & Fred's "IP theft" of SFB in the making of Star Control II. It is about the talentless hacks and thieves who have been stealing from us for the last 30 years without acknowledging it, and then daring to look us in the face and tell us that we are not even qualified to make make games while insisting that they are some types of experts. It is about how the people in the computer game industry are the most arrogant and incompetent group of people who have ever lived, and how they are literally the scum of the earth. Haven't you been paying attention? I am way ahead of you on your "little suggestions", actually an attempt to protect Paul & Fred by deflecting attention away from the actual subject, my two blogs on Gamasutra and GameDev net already have that covered and have existed for some time now. I've already done what you are suggesting there, and have already reffered to my blogs before you said this. You are just babbling nothing here, things I've already done. My comments here are specifically about Paul and Fred and their continued refusal to acknowledge where Star Control II actually came from. Like most people in the computer game industry, they are talentless hacks and thieves who built their reputation by plagiarizing their betters from the hobbyist game industry. And my guess on "Dogar and Kazon" is that they will plagiarize someone, or steal something from someone later today, since that is their nature. They should be the poster children for the entire industry. Talentless hacks and thieves who even go as far as insulting the people they steal from as they do it. The most arrogant group of people in the history of mankind!!! And this is not "off topic", this IS THE TOPIC!!!!!!!!!!!!! Paul and Freds "theft of IP" IS the topic!!! You sound like you work for them, and your last post was definitely an obvious attempt to deflect attention away from Paul and Fred's plagiarism. It was a pretty good try, too, but my family history makes me the wrong person to try and play those little propaganda tricks with. A mere PR guy like you is an amateur at this little game. And, finally, you view of how lore is developed is cute... now take into account that none of that existed in the mid-1970's. As is so often the case, Steve Cole (and in this case Franz Joseph and Lou Zocchi) invented that process. They did it first, and it would be nearly 20 years before anyone else ever did anything like it again. Your comment doesn't take into account what year it was when they did it. Oh, and to further address your propaganda effort... stop writing "walls of text". Your last post was a "wall of text". See, I can use your pathetic little propaganda phrase right back at you, PR man. I'd try to play that game with someone else if I were you, you are an amateur. Why won't you compile all the evidence of SC "creatively borrowing" from SFB in one post with pictures side by side? Internet loves it. "A picture is worth a thousand words" - some smartass. I don't need too, there are THOUSANDS of people who can tell you all of these same things. This is all VERY WELL KNOWN information. I have nothing to prove, I am not a lone voice here. Paul & Fred STOLE the Star Fleet Universe and re-named it Star Control II. Master of Orion is the same thing. And all space ship games at least trace their heritage to SFB, just like all RPGs trace their heritage to D&D. In the world of modern gaming, games since the end of WWII, there are really only three names you need to know. Charles S Roberts, Gary Gygax, and Stephen V Cole. Almost all modern games can trace their heritage back too one of these three people. But, in the case of Master of Orion and Star Control it is different. Those games were both just pure plagiarism, "theft of IP". "A little bit of Pirate Lord in your life..."
And when it comes to Franz Joseph, Lou Zocchi, and Steve Cole... Star Trek and Babylon 5 can both trace their heritage back to them. Kavik_Kang, please please go and talk to a therapist. Justified or not, your bubbling undercurrent of rage is probably not doing you any favours in life. EDIT: Also you are extremely off topic. This thread is about the legal dispute between Stardock and Paul and Fred. Make a separate topic for your own dispute. It is not off topic at all. Star Control II *IS* the Star Fleet Universe as an arcade game. It is blatantly obvious and self-evident, any SFB player can tell you this. They refuse to acknowledge this, and continue to insist that they "created" it even after being called out on it. Their theft of the Star Fleet Universe, their blatant and obvious plagiarism, is the MOST relevant thing being discussed in this thread. Anyone should be able to see that. They did nothing original, they stole almost every aspect of Star Control II from the integrated SFU and they refuse to aknowledge that. They are the poster children of the computer game industry. Talentless hacks and thieves who steal from the hobbyist game industry while insulting us as they do it. They are the scum of the earth. Thieves. Hacks. Talentless. There is nothing more relevant to this discussion that Paul & Fred's plagiarism and theft of IP. If this were untrue, couldn't Paul & Fred sue me for liable? I'm am not concerned... no lawsuit is coming my way. Because they are thieves who refuse to acknowledge what Star Control II actually is, and they know that. Seriously collect your thoughts, create a new thread for the Starcontrol II and SFB/SFU Grievances and field the questions about it in there. Why I suggested the SciFi Spaceship family tree would be so you could collect the informational paper trail of where ships came from who was the original artist of ship X as well as the original engineer of it's stats, if it's covered by a trademark or copyright, what ships are derived from it and if it's derived from something released prior to it, how the vital data from them has evolved and what it's current stats are for active SFB players. -- However make sure you put the legal disclaimers on the website of all Copyrights/Trademarks are owned by noted individuals. What is the value of Star Control? The valuable part, for us, has been the Star Control brand. That is why Paul and Fred have continually tried to associate with it. And their legal position has been consistent: Their game will be marketed as a direct sequel to Star Control II. You can't have it both ways. If the Star Control brand wasn't valuable then they would not be trying to associate with it. Even their most partisan fans agree they should get a "slap on the wrist" for having launched and cemented their game in the minds of fans as the TRUE sequel to Star Control. What should that "slap on the wrist" entail? Well, for one thing, they could have just quit kvetching about the DOS games and let them continue to be sold as they had been continuously for years. Instead, they made it crystal clear to us that they wanted to make sure we were not associated with "THEIR" game (Star Control). Except, that is not how trademarks work. That's why there was a bidding war to get the Star Control trademark at the auction. There is no sharing of trademarks. Literally. There is even a term for those that try it: Trademark dilution. It's illegal. If Paul and Fred had, for example, come out and named their game "Ur-Quan Masters II: Ghosts of the Precursors" and not associated it with Star Control we wouldn't be here. And if they decided that they didn't want the old DOS games being sold at that point, we would have complied. Not because we agreed with them but out of deference just like we removed Super-Melee from Star Control: Origins. But that's not what they did. They didn't accidentally do that. They knew, very well, before the announcement that we were very concerned about any confusion. Their position has been that their game will be made as an official, direct sequel to Star Control II and that continues, to this day, to be their legal position. And in addition to that: Each correspondence would up the ante on what they think in Star Control: Origins violates their rights. First it was Super-Melee (the word). Then it was the little Spathi trinket in the background of an alien scene. Then it was the ship designer. Then it was the look of the Earthling ship. Then it was demands that we police the community. Some of the members here were listed as people violating their rights due to your fan art that was posted on online. Then it was the demand that we actively police Steam workshop for sketches or ship designs they didn't like. Then it was the concept of Star Control itself. Then they began to make public attacks on us in public. Let's be clear: Up to this point, every representation Stardock had made of Paul and Fred had been positive even though they were willfully and aggressively violating our IP rights. Someone can argue that they think we don't have the right to sell the old DOS games on Steam. Fair enough. That seems like something that can be worked out since it's a contradiction of what Paul and Fred had previously told us (see the original post in this thread). At the very least people can agree that it's a) not clear and not really something worth doing press interviews about -- 25 year old DOS games that have been available for sale since 2011ish suddenly being a problem). What isn't debatable is that Stardock owns the trademark for Star Control and the men and women here have been working tirelessly for four years to create a new Star Control game and that Paul and Fred chose, out of the blue, after a quarter century of inactivity, to announce a new game, with not even a logo or web page, on the same week as our big Fleet Battles announcement and they did so calling it the "true" and "direct" sequel to Star Control going as far as to correct the media when any attempted to call it a "spiritual successor". And despite that, we remained publicly positive about Paul and Fred and their effort while they began to attack us because of what? the DOS game being on a channel they don't like? This all then climaxes with their filing of DMCAs not just of Star Control 1,2 but also Star Control 3. Now, I've seen people argue in this very forum that they had a right to do that against Star Control 3 (And actually, no, they didn't, not against any of them actually which is why their DMCA claim failed). The argument being that Star Control 3 contained IP from Star Control 2. Well, if you're going to argue that you can do DMCA take downs on that basis, that argument could be used against Star Control: Origins. What stops them from filing a DMCA on Star Control: Origins the week of launch because, I dunno, they decide that the Tywom look too much like one of the aliens in Star Control II? Or that they think we have to remove our ship designer. That move would ruin us. 1. They had already done something that even the fans agree they shouldn't have done: Claim their game was a direct sequel to Star Control II, complete with the *literal* box that was used by Accolade as their trademark sample (could you get any more blatant than that?) and the claim that THEY, not Accolade, released Star Control. Their most ardent fans agree that they should get some "slap on the wrist". Ok? How about they stop doing it and just let the old games continue to be sold and work with us in the future to avoid such misunderstandings. How about we even throw in that we would put in writing that their aliens and characters and lore are exclusively theirs and no license exists? Is that unreasonable? This was in November. They absolutely knew we would eventually have to seek legal action. But if you look at their public posts, they act as if they're shocked, shocked that this would happen. 3. They had engaged in a series of very public attacks on us because we hadn't taken the games down. It should be noted, which Paul and Fred claim they have the agreement with GOG. So how is it our fault that it's up on GOG right now? Stardock added it to Steam for the 25th anniversary but it had been up on Steam (you an check the original submission date) for years. We were waiting for the 25th anniversary to post it. But do the dozens of sales on Steam a week justify their public PR attacks on us while they are simultaneously promoting their game as the "true" sequel to Star Control? So that's where things stood before any lawsuits were filed. As for the mess since and the trademarking. 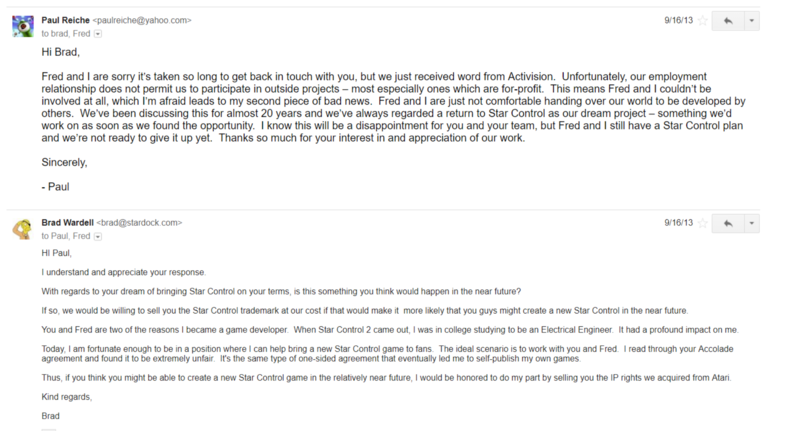 Our position is, especially after their attempt to cancel our trademark, which is that no games related to Star Control are going to be released without our permission. Thus, if Paul and Fred or anyone else wants to make something that people associate with Star Control they will need our license just as if we wanted to use the lore, characters and setting from Star Control II we would need Paul's license. You can see, at various points, how easy this would have been to resolve. Now? A lot more damage has been done and even attempts at settlement end up with them posting misleading representations of what was in there (the apology demand was particularly galling, not only would it be petty to ask industry legends to apologize but it would be a terrible PR idea). I realize that is long. But there you have it. Frankly, your arguments come across as the ravings of a madman. Generally people only sue for libel when the libel is taken seriously. Whether there is anything in what you say or not, the way you are making your arguments is so utterly unconvincing that no one cares. You're just saying the same thing over and over, paraphrasing yourself each time. Please, take it to another thread, I'm following this one because I'm following the dispute between Stardock and Fred and Paul, not SFB and Fred and Paul. Thank you for the summary of your side Brad. Could you ask Kavik_Kang to keep it on topic? I am on topic, your attempts to claim otherwise are just an indirect means to attempt to silence me. Again, I have nothing to prove. There are MANY, MANY people who know that both Master or Orion and Star Control were blatant, obvious, clear-cut plagairism and theft of the Star Fleet Universe. There were others as well, but I'll just stick with these two to keep things simple. This is the MOST relevant discussion taking place in this thread. Paul & Fred stole the Star Fleet Universe. It was plagiarism. "IP theft". Blatant and obvious. There is NOTHING about Star Control II as a game that is not directly stolen from the Star Fleet Universe. They claim that Stardock is "stealing their game". It's not their game, and never has been. It is Steve Cole's game. All of your respect and admiration of Paul & Fred are misplaced, the person you actually admire and respect so much is Steve Cole. It's his game, not Paul & Fred's. They stole it all from SVC. What are Paul & Fred claiming is "theirs"? Other than the story and the characters, nothing in SCII is theirs or their ideas. It's all ours, Steve Cole's. Just like Master of Orion. You obviously are not interested in the dispute between Stardock and Paul & Fred, you just want to defend Paul & Fred and don't like the fact that someone who knows the actual history of it is here deflating your misconceptions about your "heroes". They did nothing except steal from SVC. Star Control II ***IS*** the SFU as an arcade game. You are an ignorant, deranged lunatic with a man-crush obsession with Paul & Fred. It blinds you to the fact that they are liars, thieves, and plagiarists who stole the work Steve Cole and the SFB Staff and claimed it as their own. Even now, after one of us FINALLY speaks out about it, you continue to defend them. Because your puny little brain can comprehend what is such a simple thing to understand. Maybe you should seek professional help, you seem to have an unhealthy hero worship of these two incompetent thieves. Do you still want to play Vladimir Lenin's little game of trying to make the other guy out to be some type of lunatic, or are you done yet? If not, I can get really nasty next time around if you want to keep attempting to paint me as mentally unstable. Vladimir Lenin was a truly evil person, why are you trying to use his tactics against me? I can only imagine that it is because you are like him in some ways... "Shall we play a game?" Enough on Starfleet Battles please. You are welcome to create a new thread on it. Why don't you try asking Paul & Fred about this? They'll either confirm it for you, or prove that everything I have said in this thread is true. One or the other. There are thousands of people out there who can confirm that everything I have said in this thread is true. 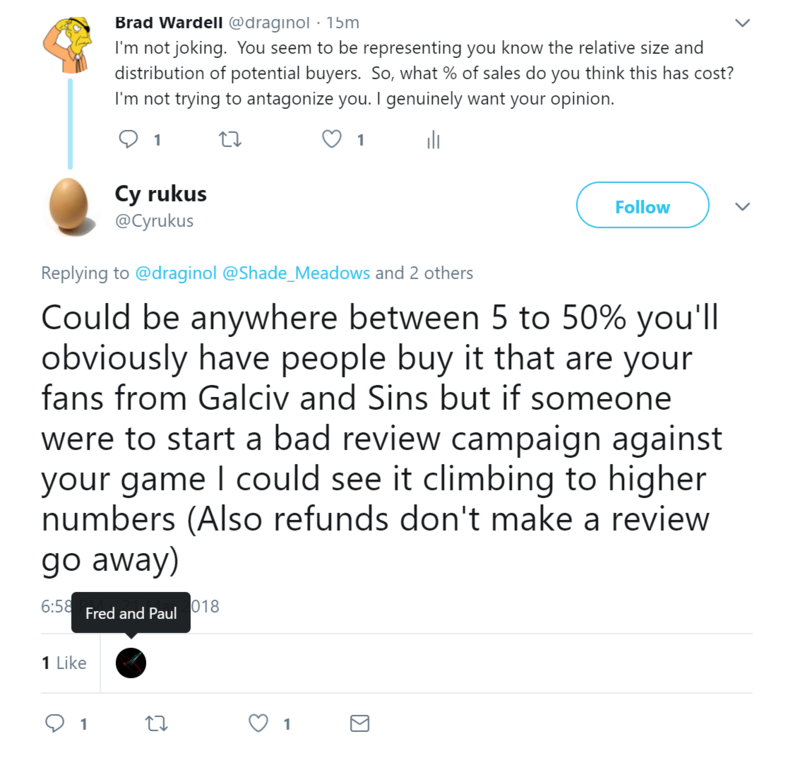 My question is about the fans, i see people try to defame Brad on twitter a lot, and my opinion on the matter aside... why are they attacking Brad and not Stardock itself? I think simplifying my question is: "Do you think the Hate-Fanbase will affect anything at all?" Wow I haven't checked on this topic in a while and there have been some interesting developments. As I said at the beginning, everything that Brad and his company have done have been, as he put it, "taking the high road" and they are doing the right thing in protecting their IP. Laymen (i.e. all of us) get upset about what Stardock's lawyers are looking to do, but frankly, they are doing *absolutely* the right thing here by throwing in the kitchen sink given how P&F have acted and responded. As I suspected from the beginning, P&F are being entirely driven by their emotions and what they think is right and ignoring the reality (i.e. legal landscape) of the situation. You can see it from their ridiculous, unprofessional postings, use of a PR firm (wtf, are you guys idiots? ), the tone in the emails they sent, and other moves that have only really made them look like jackasses. Like Brad, I hold them and the Star Control II team on a pedestal, which makes this all very disheartening. As Brad recently mentioned earlier in this post, it's really hard to take all these disparate game concepts and blend them together into something that works. Lots of instances where that blending goes horribly wrong and it's a disaster of a game. I'm sure that's also why Brad's team is taking so much time to build Star Control: Origins, because they are mindful of this and want to make a truly great game. I think if P&F never made public statements and had just talked to their lawyers about what the correct moves were, you'd think this wouldn't be the way it is. Emotions don't drive justice, the law does. Unfortunately, they believe the correct answer is based on their emotions and are now being met with the reality of the law. The sad part is that if P&F had just taken a step back and been more thoughtful about what their legal rights were, they could have avoided all this and come to a rational agreement with Stardock. I continue to wish Stardock the best of luck in resolving this, as their success in this lawsuit is in the best interest of all Star Control fans out there that want to play more Star Control. PS: For Brad, next time you're visiting the DC area to check on the team, grab a Bold Rock Hard Cider (IPA). I never used to like ciders at all, but this is so good you don't even realize you've finished drinking it when you go for that next swig. Will help you forget about all this! We've abandoned it. It got taken over by a small group of rabid PF partisans plus a bunch of anonymous, new account people. There was no point in investing in that sub when it only has 700 subscribers when a year from now after release the one that we promote will likely have 10X as many subscribers and be in a sub we have more say over. I will take you up on that. Stardock has a studio in Towson Maryland, not far from DC. Well... It is kinda of Chaotic there now... not many hateful submissions... but when you enter them to see the comments... THEN you see the War. Glad to have a Reddit for like-minded people! going to post something there now, just to be part of it already! The difference is that nobody (and I do mean nobody) except you cares about any link between Starcon and SFB. We're talking about SC1/2 and SCO. NOBODY HERE CARES about SFB. Please, for the love of god, stop going on and on about it in 10 paragraph long posts. Sorry dude. But you just need to stop. We don't care. You are clearly missing the point. To abide by Brad's request I will only say that the point was, obviously, that "people in glass houses should not throw bricks." I can't resist also pointing out that people questioning the accuracy of what I am saying is just more proof that people in the computer game industry are incompetent when it comes to games, which I have been saying publicly for years. This proves it, yet again. Anyone who knew the history of games would know all of this already. Clearly they don't know this history, which I've always known but now you can also see. They actually act like I have to prove something here, or there is any question at all about this with regard to either Master of Orion or Star Control. THOUSANDS of people know that everything I have said in this thread was true. None of them are in the computer game industry, because nobody in the computer game industry actually knows anything about games... as this situation demonstrates. Or, in other words, they are incompetent. Why don't you go ask Paul & Fred about it. They will either confirm what I have said, or they will lie with thousands of people out their who can definitively contradict their lies and confirm the true history that I have mentioned in this thread. While your at it, why don't you ask the Master of Orion guys, too. We'll find out if they are actually "the scum of the earth" or not... based on their answer. It's not like I am some lone voice here, there are thousands of people who know this. People who know about games, which of course doesn't include the people who work in the computer game industry. Because they are incompetent, as this situation demonstrates. Again. Except you're not abiding by Brad's request.